Click here to read all my SYS1 posts. These 2018 results were never going to be great. A profit warning in August set the tone for the year, with poor interims issued during October being followed by another warning in January. A statement during April then indicated pre-tax profit would come in between £1.6m and £2.0m. In the event, SYS1 reported a pre-tax profit at the top of that range, albeit down 72% on last year’s effort. Gross profit — SYS1’s “main top-line performance indicator” — dived 18% while operating profit crashed 69%. At least the ordinary dividend was maintained at 7.5p per share. However, cost savings made during the second half improved H2 margins a little. Management also claimed administration costs during this coming year should be no more than last year. 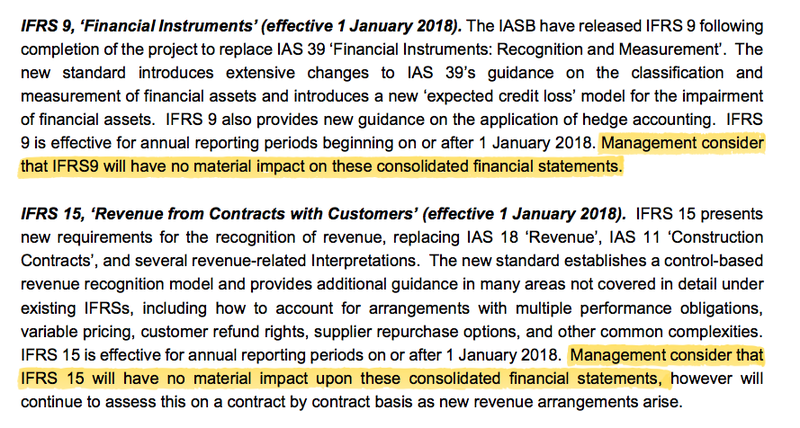 When SYS1 issued a profit warning in 2012, the group blamed the shortfall on clients not spending their “unused budgets” during November and December. I dare say the latest round of client cutbacks (see below) also curtailed the spending of “unused budgets” towards the end of the calendar year. The silver lining of these results was the candid management narrative. Shareholders received a comprehensive explanation for the profit setback, with founder/chief exec John Kearon even going as far as describing the year as “miserable”. SYS1 claimed its “creative, discretionary” services had borne the brunt of the ‘FMCG’ budget constraints. The total number of projects slid 6%, the average project value fell 13% and the number of clients dropped 9%. “The realisation that client budget-cuts were significant and probably permanent galvanised us to react, rethink and reinvent…”. The reacting, rethinking and reinventing involved automating certain research services, which apparently could lead to greater recurring revenue. One interesting project is to use the new automated procedures to rate every UK and US television advert, with clients accessing the verdicts through an online subscription service. The new service — to launch later this year — will apparently be “dramatically better, cheaper and faster” than any existing alternative. “The shifts in the market towards lower cost automated solutions where data is viewed as a commodity is likely to continue unabated, and will continue to put pressure on the Company’s services. It is not clear to me what proportion of last year’s lost business was due to client cutbacks and what proportion was due to greater competition. In the past, SYS1 had exhibited some confidence about its competitive advantage. It appears some rivals may have now replicated SYS1’s databases — or at least developed something quite similar. Reacting to fresh competition is what SYS1 describes as “successful adaptation to change, [which] requires bold ideas, grit, creativity and a great deal of hard work”. The reality, though, is continual and seemingly substantial product changes — which you would not necessarily expect from a business with a true competitive advantage. Yet this latest statement made no mention of those product updates. The segmental reporting has now altered in each of the last five years. The profit shortfall has meant SYS1’s accounting ratios are no longer as attractive as they once were. Cash capital expenditure continues to be more than covered by the depreciation and amortisation charged to the income statement. Meanwhile, working-capital movements once again produced a favourable cash inflow. The cash generation helped fund ordinary/special dividend payments of £4.2m, which left the bank balance £2.5m lighter at £5.8m (46p per share). SYS1 continues to operate without debt and remains free of any final-salary pension obligations. My valuation sums are not straightforward. iv) About 40% of profit (before central costs) emanates from the United States, where the tax rate has been cut from 35% to 21%. 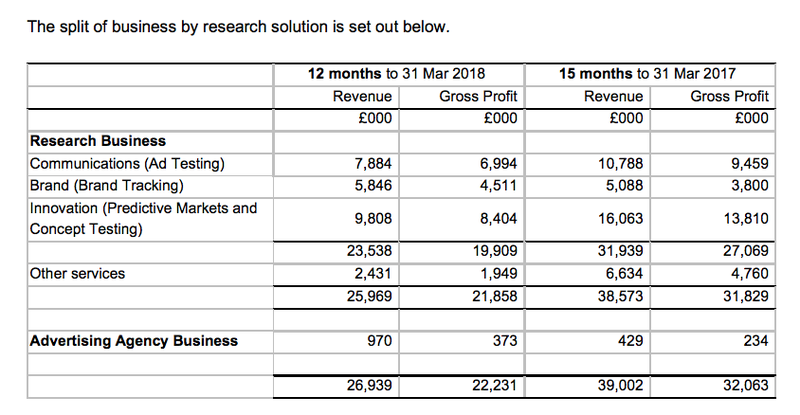 Taking the optimistic view and doubling the H2 operating profit, ignoring the redundancy and start-up costs, and guessing the group tax rate drops from 39% to 33%, I arrive at a £3.2m operating profit and earnings of £2.2m or 17p per share. Then adjusting the £37.4m (at 300p) market cap for the £5.8m net cash position, I arrive at an enterprise value of £31.6m or 254p per share. Dividing that 254p by my 17p per share earnings figure gives a P/E of almost 15. Nevertheless, the aforementioned Mr Kearon did oversee SYS1’s recovery from its difficult 2012 — operating profit had almost quadrupled by 2017 — and I can only hope his irrepressible enthusiasm, 19-year leadership experience and 27%/£10m shareholding can support another turnaround. In the meantime, the ordinary 7.5p per share dividend supports a 2.5% income. Disclosure: Maynard owns shares in System1. Top marks for SYS1 for publishing its full annual report through the results RNS. Here are the points of interest. Highlighted, too, is an extra line about small client behavioural changes, plus a revised section about the group’s competitive advantage. His £200k salary would certainly not appear outrageous should profit recover to past levels. I am pleased the participants still believe the performance targets are achievable. One performance target is a 994.5p share price seen during July 2021. So at least one part of the business did well. Furthermore, the main three divisions collectively saw gross profit slide 15% (to £19.9m) — the whole group saw gross profit slide 18%. The 15-month 2017 figure was £3,402k, which translates to £2,722k for 12 months, versus £2,563k for 2018. At 9.5%, the largest client’s revenue contribution was the highest since 2013 (also 9.5%). I was not surprised to see SYS1’s employee ratios vary somewhat from the 2017 figures. Anyway, based on the 165 average, gross profit per employee fell from £169k to £135k — yet still towards the top of the £108k to £138k range seen during 2011 to 2015. The average cost per employee fell from £87k to £77k — and in the mid-range of the £70k to £84k seen during 2011 to 2015. Employee costs as a proportion of gross profit fell from 55% to 51% — towards the lower range of the 49% to 55% seen during 2011 to 2015. Overall I get the impression SYS1 has managed its headcount reduction quite well. I calculate trade receivables as a proportion of revenue was 20%, which compares to a historically low 18% for 2017 and 24%-plus for 2016 and prior. So no real worries there. However, 69% of trade receivables were not classed as past due, versus 69% for 2017 and 76%-plus for 2016 and prior. So of the bills that remain outstanding, a fraction more have become overdue since 2016. 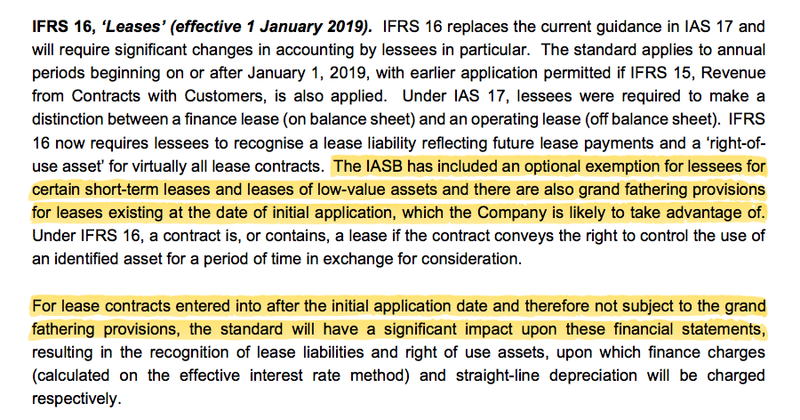 Not overly worrying, given the wider cash-flow characteristics reported within the Blog post above, but perhaps of minor interest all the same. Hi, Maynard. Excellent article as usual. It’s difficult with SYS1. A lot of aspects of the business are excellent (or good, at least) – cash generation, returns on capital and so on, plus of course being founder-led. I think there is probably a lot in what Kearon says about multinationals’ marketing spending. That is certainly consistent with what the likes of WPP have said. The difference though is that WPP, Omnicom, and other ad agencies (M&C Saatchi is a very interesting UK quoted example) have much higher or more reliable client retention and recurring revenue than SYS1. So far, at least, it’s meant that ad agencies aren’t growing, but nor are they really shrinking. A contrary theory is that more marketing is being done by big brands in house because digital platforms (particularly Facebook and Google) effectively do a lot of the work that the ad agencies used to do through their targeting and analytical tools. I think there may be something in this but at the same time prices of ads on Facebook are upvby like 50% over last year! How sustainable can that be? Not sure whether this is something you’ve considered, but it could be partly behind SYS1’s struggles. Probably one I’ll keep watching for the moment though it could certainly be a good recovery play. Thanks for the comment, and reminding me about M&C Saatchi. I must admit I have not really considered Google and Facebook, and clients doing their own research in house. I think Google/Facebook’s info could tell a client how many people watched an advert, but not how many people may act on it. SYS1’s techniques indicate to clients how many people are likely to act on the ad, which I guess is what advertising is ultimately all about. Thanks for the update. I don’t own them but have kept a lazy eye on them. Do you know who some of their competitors are ? I was also wondering whether some of the advertising tools/metrics that Google or Facebook provider would be considered competition ? For example, Google would know YouTube ads are skipped or watched ? Thanks for the comment. 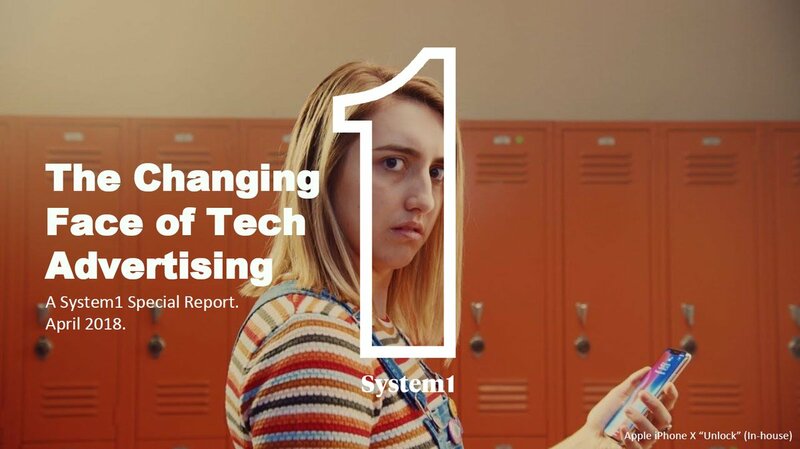 I understand many larger advertising agencies have tried to get involved with the ‘system 1’ way of thinking, and they are the main competition with all market research (whether ‘system 1’ or not). I do not know of any pure ‘system 1’ firms, although I am sure there are a few. Yes, Google and Facebook will hold all sorts of data — and so they will hold some sort of ‘effectiveness’ ratings, too. SYS1’s data is for TV/cinema ads, where there isn’t click data available to assess. According to SYS1, the market-research sector is changing quite rapidly, so I doubt the firm enjoys a sustainable competitive advantage (in the conventional Buffett sense) right now. What counts at the moment is whether the founder/chief exec really has the ability and desire to navigate the sector changes, redevelop existing products and deliver what clients really want, and eventually expand the business multi-fold as he suggested could happen the other year. Yesterday I attended SYS1’s AGM. I attended the 2016 event, when only one other investor turned up. This year there were four other ordinary investors, as well as an American analyst (presumably working for a fund). Lots of questions were asked after the meeting’s formalities, and there was plenty of time for a post-meeting chit-chat with the directors as well. This AGM was a little peculiar, given a non-exec was appointed the day before and an executive announced his resignation the day after. It was a bit odd that every one of the directors was up for re-election at the AGM except the new non-exec. I should add that the new non-exec works in marketing for Mars, and looks a good appointment. I am not sure what to make of the departure of exec director Alex Hunt, who was appointed to the board in 2017, was President of System1 Research and had overseen the group’s US department. SYS1 ‘restructured’ its chief operating officer out of his role in 2017, and the ‘third’ executive position (alongside the chief exec and finance director) now remains open again. As always, my notes below are my best recollection of what was said and generally paraphrased with the odd direct quote. I must admit to paying more attention to the answers given to my questions than to some of the others. Chief exec John Kearon did most of the talking. Q: Results said: “Competitors are increasingly adopting the behavioural science approaches that the Company has been advocating for many years”. Sounds like SYS1 has lost some ground to rivals? A: Growing competition is “not a bad thing”. Company is a “brand leader” when it comes to System1-type market research, which is now underlined by the name change. Growing industry recognition of System1-type research ought to put SYS1 in the frame for new business as the pioneer. “A rising tide lifts all boats”. Competitors are divided into two camps: 1) traditional research agencies that are window dressing their products as System1-type products (“putting lipstick on a pig”), and; 2) new start ups with System1-type products. Should “celebrate” new start-ups as it suggests System1-type thinking is becoming more prevalent among marketing clients in general. I got the impression SYS1’s competitive advantage appears not to be its database of past research, the type of testing it does etc, but its pioneering reputation and “brand leadership” of the System1 way of thinking. Clients moving to that way of thinking would surely consider SYS1 as an agency alongside any start-up/rival offering similar System1 products. Q: Results said 2018/19 would be a “period of transition”. But two years ago, the results for 2015 was “in some respects a year of transition” as Company refocused on ‘Juicy’ products over ‘Twist’ products. So…company always seems to have a few good years, then something goes wrong, then has a period of transition to regroup. Is all this transition just a feature of the market-research industry. where things just keep on changing? Q: New Ad Ratings service — what is the progress and potential? A: Launched as a beta service to “friends and family” a few weeks ago. Not had a great start. Still has a few bugs. “Some work to do”. It’s a subscription service, with a longer-term plan to encourage existing clients to pay for, and will be an additional service. Will cost clients £1k/month to receive all ratings for all UK/US adverts in one particular advertising category. Company has c200 clients and there was director talk of 2,000 clients for this Ad Ratings service. Company believes pricing will attract new clients to SYS1. £12k/year for SYS1 ratings per advert category versus $340k/year for Nielsen and $240k/year for another (Asymetrics?). Ultra low pricing ought to encourage subscribers. Ad Testing clients then ought to be ripe for conversion into other SYS1 services (conversion chance likely to be twice as high compared to converting new clients now). Q: Creative Guidance System and separating Prediction and Direction — won’t that produce less revenue than before, as SYS1 will only charge for Direction on good ideas? A: Possibly. But the ability to only test (Prediction) ideas without having to pay for the more expensive ‘consultancy’ (Direction) should mean (and I think the early signs show this) is that clients will present more ideas for testing. So clients with some smaller brands can now provide those ideas for testing, and clients who could not afford the combined Prediction and Direction service can now afford the Prediction (testing) service. Cost of testing an idea for a larger client is £1k per idea, with £6k paid for SYS1’s advice for subsequent improvements. Q: Results referred to fewer larger (£100k-£300k] projects. How much gross profit do £100k-plus projects represent now, and what are the chances of losing these larger projects this year? A: Last year, ‘chunky projects” represented £1m-plus of gross profit. Now define a large project as £75k (I think). No longer have that many to lose. Q: Brand tracking — smallest division that did relatively well last year. Thoughts? A: Big decision by clients to embark on Brand Tracking — it’s an ongoing commitment, unlike the ad-hoc testing and research work the other divisions do. Set-up is costly. Q: Report small-print says: “The LTIP participants still believe [the performance targets] are achievable, at least at the lower levels of the bands”. LTIP target requires share price to reach 995p by July 2021 to produce any payment — so on what are the LTIP participants basing their optimism. A: LTIP target also effectively include gross profit reaching £40m, which if achieved would see earnings rise and the share price follow suit. Inserted the line to tell shareholders the company “had not given up yet” on the targets. (The non-exec chair of the remuneration committee chipped in with further LTIP details, saying the firm had invited comments from major shareholders about the scheme, had made the scheme four years long instead of the usual three, and said there would be no adjustments. The non-exec in question is a Yorkshireman, so seems the right person to keep pay under control in a London marketing agency :-) This non-exec has now become chairman). Q: Results revealed quarterly gross profit figures for past two years, and showed some volatility, but no trading statement accompanied this AGM. Can we assume trading is going to plan? A: That is your interpretation (laughter). Don’t usually issue quarterly updates, only when trading is likely to deviate significantly from forecast (I recall the 2017 AGM was accompanied by a profit warning). * Last year’s cost cutting — no more cuts. * 5-star marketing examples — Belvita ad https://www.youtube.com/watch?v=BAByjomVFvw . Meerkats for Comparethemarket — textbook example of long-term brand building (SYS1 not involved). Have been involved with Moneysupermarket of late. * Tax rate post-US reforms — like to get the rate below 30%. * Google — not really considered competition. Analytics service is data driven and more System2-type thinking. * World Cup ads — very mixed bag. Betting ads aimed at short-term ROI — pay X for an ad and receive Y in extra customers in the next few days. Ads not long-term brand building as per the System1 approach. I noticed that Boyles have recently sold out of their position. I had wondered if they had lost faith in management and the business. However, it looks like the reason for sale was the closure of their fund. Good spot. I had noticed Boyles had sold, and thought it was a bit odd a supposed ‘business perspective’ asset manager would get rid at this point. Not sure why the fund has closed — presumably poor performance. Just goes to show that selling is not always driven by company fundamentals. I should add that I bought more SYS1 shares last month. System1 announces that it is preparing to launch its new Ad Ratings subscription service later in the current financial year. This service will provide clients with access to a large database of adverts broadcast in the UK and the US which are rated using the Company’s advertising effectiveness measures. It will enable clients to compare the effectiveness of their adverts with those of competitors and to correlate advertising effectiveness with media spend. The Company is investing a significant amount in developing this service, which it views as having strategic importance both in supporting the current business and in broadening the use of its core intellectual property to create new scalable revenue streams. Over H1, the Company will have invested some £1.8m and further material investment is planned in H2. This investment is being undertaken at a time when current business revenues are stabilising, albeit at a slower rate than anticipated. As a result of lower operating costs (excluding Ad Ratings) a return to growth in operating profits vs H1 prior year (again, excluding Ad Ratings) is anticipated. The Company believes that revenues from the Ad Ratings service will begin towards the end of H2. The Company will be providing its usual trading update soon after its H1 period end (30 September 2018). Director talk at the AGM suggested development of the Ad Ratings service had not gone entirely to plan so far. However, the concept remains interesting — at least to me — and I think there should be demand for the product. This SYS1 blog post gives an outline of the service. I see SYS1 will invest a “significant” £1.6m during H1 and a further “material” amount during H2 into the Ad Ratings project. The sums mentioned are larger than I had anticipated. Perhaps £3m (24p per share) for the full year? I had formed the impression that notable Ad Ratings costs would only be incurred if the new service launch was successful. At least “current business revenues are stabilising, albeit at a slower rate than anticipated“. I am hopeful this means revenue may now have levelled out following last year’s decline. That said, H1 2018 operating profit beating the £840k operating profit of H1 2017 does not sound like a huge achievement. Just wanted to say a massive thanks for all the write ups you’ve done on various companies over the years. Very glad I stumbled across your link to this on Stockopedia. Much easier to understand what is really happening behind closed doors. Particularly enjoy your coverage of AGMs as often I cannot attend. I am sure I will meet you at one sooner or later, and will be able to thank you in person. Thank you for sharing the above, especially the AGM write-up which is very useful. If we simply multiply out 2,000 clients at £12k /yr, that would suggest £24m of revenue from this new service. Appreciate it is costing quite a bit to get the product launched, but would guess that ongoing development / maintenance shouldn’t be too high. Therefore, a lot of this revenue could in theory drop through to profits. This would clearly be transformational for the company. Am I missing something obvious here? Also, did you manage to gain any insight at the AGM or elsewhere as to how likely the 2,000 clients figure is, and how long they think it might take to get to that level? The board tempered the enthusiasm of those attending with regards to the new service, and I felt the talk of 2,000 clients sounded like an ultimate goal rather than a realistic near-term target. The latest trading update suggests the new service will produce revenue before the end of March. I think SYS1 had expected the revenue to be produced earlier. So perhaps the talk of 2,000 is optimistic. From what I recall of the meeting, I asked why would non-clients sign up to the new service, and the chief exec spoke about the low price, which he thought would interest them given they are paying way more for other similar services — and the 2,000 figure was then mentioned. Nobody (including me) at the AGM pressed on the 2,000 figure because of the earlier “some work to do” comments and the projection just sounded like guesswork at the time. So I am not putting much store on the 2,000 number — for now I would just like to see the service’s revenue cover the associated running costs. But if the service takes off, then as you say the contribution could be very significant. Thanks for the response Maynard, makes sense. I’ve had an eye half on SYS1 for a while now, and am particularly interested at recent prices. It seems they are in a fairly fragile position, being subject to large companies marketing budgets and seemingly needing to innovate / change quickly to keep up. On the flip side they come across well from what I’ve read, and if they can get the main business back on track they could be worth a fair bit more than the current price. Further there seems to be big potential upside in the new Ad Ratings service, which is interesting. Probably time for me to do more research! Any comment on the 15th of October update Maynard? Interims are Friday 2nd November. Not yet :-) Half-term duties, SharePad articles and a TSTL write-up are currently on my to-do list. Sorry about that. But I will recap SYS1 at some point. The share price does look interesting at present. Nice to know there is someone asking for my thoughts though! I really like your work and I’ve had my eye on SYS1 for some years. I’ve never thought it was as good as the rating used to imply because many of the techniques can be replicated and that they look to be behind in digital. Unlike YOU, they don’t have a panel to test brand awareness and research new ideas. I used to hold YOU but was disappointed by the culture of excpetionals and the decision to capitalise the costs of the panel (and then exclude the cost of amortising intangibles from underlying EPS!) and sold. The main risk is that John Kearon stops being involved as the business relies on his drive, vision and charisma; he could sell snow to the Eskimos. I was wondering if you have a view on this. Furthermore, the new AdRatings product looks like a ” mass market” product and I’m not sure that SYS1 are set up to distribute this kind of thing. I get the sense that the strength of the business lies in higher value added projects. Also I’d question the pricing strategy. If it does the same as the other products and is better, why not charge more. I can see the reasoning of making it cheap to derisk the purchase but at the same time the low price could undermine its perceived value. I met you years ago at MF’s offices when we were introduced by Ed Bowsher. I was running a value driven special sits fund at the time. I am glad you find the Blog useful. I have never looked at YOU because of its accounting, but I am sure SYS1 does employ an online panel. I would agree that John Kearon leaving is the major risk and you are right about snow and eskimos (I sometimes wonder if he has sold me up the river with this business.). I am not so sure about the higher-value projects. Major multinational clients are always looking to save costs (certainly in advertising it seems) and the Ad Ratings service seems a relatively simple data-service proposition (assuming you believe in SYS1’s ratings that is). From attending the AGM, I got the impression that SYS1 priced the service so much lower so that potential new clients could not ignore it and not have budget as an excuse not to at least try it. PS You will have to forgive me, but I can’t remember the introduction! Just thought I would post this trading statement from 15th October. An article covering the interim results should be published next week. The first half of the current year (H1) saw Gross Profit (our main top-line performance indicator) stabilizing, albeit at a slower rate than we anticipated at the start of the year. We expect Gross Profit for the half year to be some 5% below that of the comparable period. Operating Costs in H1 were tightly controlled and, excluding the Company’s investment in the new Ad Ratings subscription service, are expected to be some 14% below those in the comparable 2017/18 period. Underlying H1 Pre-tax profits, pre-Ad Ratings and share based payments, are expected to be around £1.9m, some 73% above the £1.1m achieved in H1 2017/18. As reported in our update of September 10, 2018 H1 has seen substantial investment in Ad Ratings, a subscription service which will enable clients to compare the effectiveness of their historic adverts with those of competitors and to correlate advertising effectiveness with media spend. Over H1, the Company has invested £1.7m in the new service. Further material investment will take place during the remainder of the current financial year, as we move towards a phased launch of the service – due to begin towards the end of the financial year. System1’s financial position remains strong. 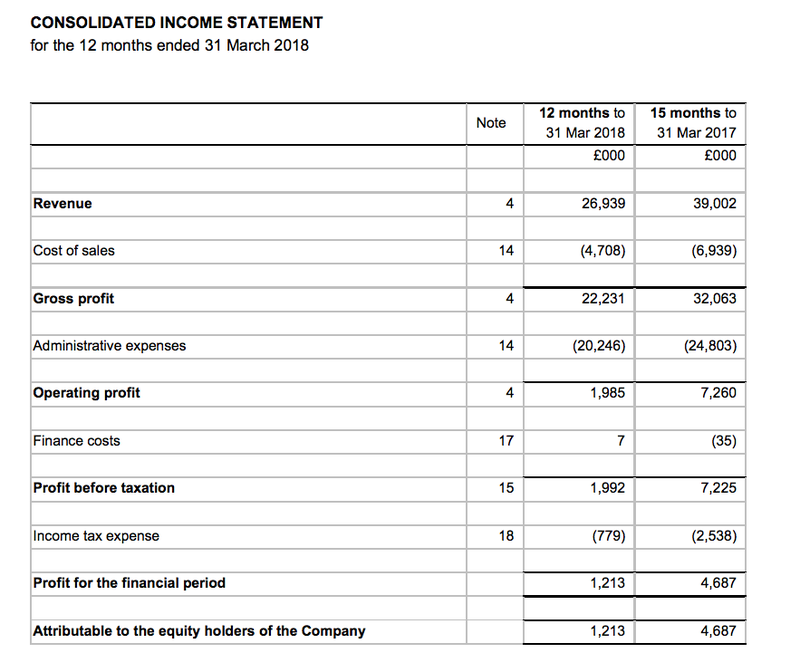 Despite the heavy investment in Ad Ratings and the payment of the 2017/18 final dividend during H1, at the end of the period the Company had a cash balance of £3.6m, compared with £5.8m at end-March 2018. System1 has no debt.